Description Features: The wall clock is with 3D effect Mirror surface, glossier, add a modern flavor to your home Decorate your home in your own way with this creative DIY wall clock Easy to install and remove the sticker Reasonable price and high quality Perfect to decorate your living room or bedroom to match different decoration style A fashion and creative DIY wall clock will make your living room more personalized and unique. We ensure every components of this wall clock is in its perfect state. It is also a best gift for your families, colleagues, and friends! Specifications: Style: Stylish creative pattern Material: Acrylic Power: 1* AA battery (not included) Overall Size: 120cm * 120cm (High* Width. 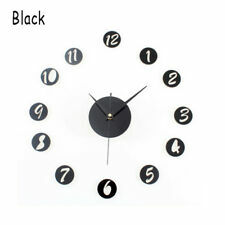 APPROX) Color: Silver, Black Package included: 1 x DIY Roman Numeral 3D Wall. Features: The wall clock is with 3D effect Mirror surface, glossier, add a modern flavor to your home Decorate your home in your own way with this creative DIY wall clock Easy to install and remove the sticker Reasonable price and high quality Perfect to decorate your living room or bedroom to match different decoration style A fashion and creative DIY wall clock will make your living room more personalized and unique. 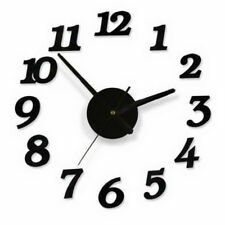 We ensure every components of this wall clock is in its perfect state. It is also a best gift for your families, colleagues, and friends! Specifications: Style: Stylish creative pattern Material: Acrylic Power: 1* AA battery (not included) Overall Size: 120cm * 120cm (High* Width. 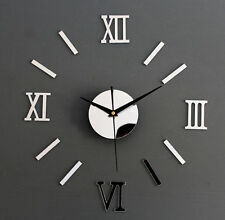 APPROX) Color: Silver Package included: 1 x DIY Roman Numeral 3D Wall Clock Note: Recomme. 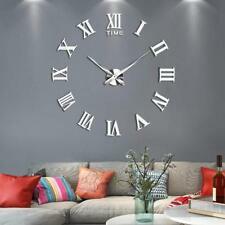 A fashion and creative DIY wall clock will make your living room more personalized and unique. We ensure every components of this wall clock is in its perfect state. It is also a best gift for your families, colleagues, and friends! 1x DIY digital wall clock （Batteries not included）. A set of products, including 12 Numbers and eight dots, truly to DIY. Material: Acrylic. Draft standards of combined size:38.5 cm. Digital size:5 7 cm. 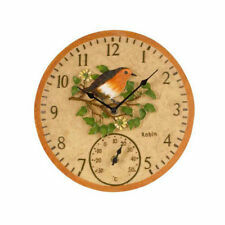 This modern style wall clock from HOMCOM will be a perfect addition to add in your living space. Made from sturdy plastic with acrylic lens it withstands accitental fall. LIGHTWEIGHT& EASY TO INSTALL: Only weights 0.9kg. Stick to the right place directly. Tear off the transparent coat on the surface of the sticker. It is a good gift for your lover,family,friend and coworkers.